When in 1933, Invicta moved to London, the factory in Cobham was taken over by Reid Railton. One of Railton's principal clients was John Cobb who was obsessed by speed. There was nothing he liked better than breaking world records. Especially for Cobb, Railton, a car including the Napier-Railton, a car with an aircraft engine with which Cobb reached a speed of 143.44 mph (229.504 kph) at the Brooklands race-track. Railton had already gained a great deal of experience with the E.R.A. sports and racing cars. When he decided to start manufacturing cars under his own name he definitely knew what he was letting himself in for. The first models, with a four-seater body, were built on a reinforced Terraplane or Hudson chassis. Railton replaced the weak suspension by real sports car suspension. In 1933, the eight-in-line engine had 4010 cc and delivered 95 bhp at 3600 rpm. The cars had a top speed of 94 mph (150 kph). When the original models were improved in America, Railton immediately adapted his cars. For example, in 1934 the cylinder capacity was increased to 4168 cc which delivered 113 bhp at 3800 rpm. In 1937, Hudson presented a six-cylinder model. 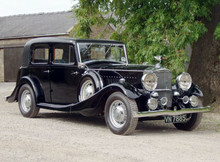 This model then constituted the basis for the Railton Light Sports. The model was powered by a six-cylinder 2723 cc, 76 bhp at 3800 rpm engine. In 1938, customers could also opt for a 3475 cc cylinder capacity which delivered 114 bhp. In 1939, Railton presented the Baby Railton with a 10 bhp Standard engine, but no one was interested in the model. In total, Railton built just over 1,400 cars. Just before the war he sold his company to an American Hudson dealer in London.